This is a guest post by Kelly Boeckman. Kelly is a Partner Manager at AWS who is focused on the Storage segment. Benjamin Franklin once famously said, “In this world nothing can be said to be certain, except death and taxes.” It’s worth noting, however, that Ben was living in the late 1700s, and was unable to conceive of a third certainty: data growth. So you’ve got your data safely deduped and stored in Amazon Simple Storage Service (Amazon S3), but surely that data can provide more value than just sitting there? Other teams across your organization could undoubtedly derive value from copies of that data. Maybe your developers could create new features or QA teams could more accurately test against your code base if they can test against a whole set of your cloud data. Today, we want to tell you about an innovative solution in this space from APN Technology Partner StorReduce that can help you do more with your data for less. StorReduce has announced support for cloning on object storage such as S3 and Standard-Infrequent Access (Standard – IA). This support allows users and administrators to make copy-on-write copies of objects stored with StorReduce in a rapid, space-efficient manner at petabyte scale. 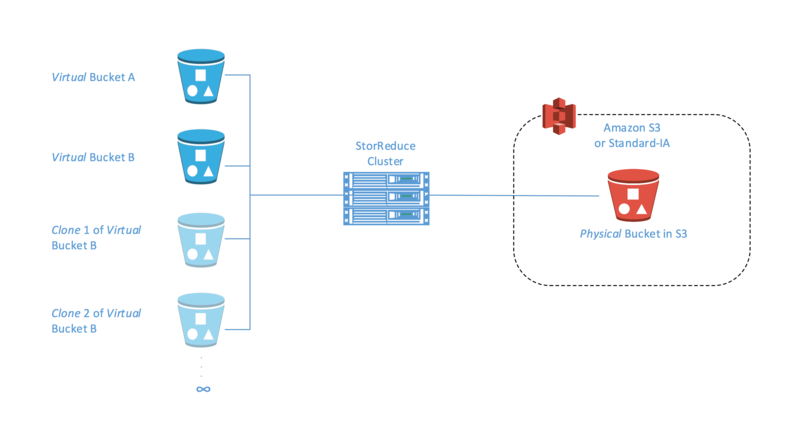 StorReduce can help enterprises storing unstructured data to S3 or Amazon Glacier on AWS to reduce the amount and cost of storage significantly. It also offers enterprises another way to migrate backup appliance data and large tape archives to AWS. StorReduce’s scale-out deduplication software runs on the cloud or in a data center and scales to petabytes of data. The variable block length deduplication removes any redundant blocks of data before it is stored so that only one copy of each block is stored. StorReduce provides throughput of more than 1 gigabyte per second per server for both reads and writes. A StorReduce cluster can scale to tens or hundreds of servers and provide throughputs of 10s to 100s of gigabytes per second. StorReduce is suitable to deduplicate most data workloads, particularly backup, archive, Hadoop cluster backups, and general unstructured file data. Because StorReduce has read-only endpoints and a cloud-native interface, data that it migrates to the AWS Cloud can be reused with cloud services. Storage volume cloning is a long-standing feature of most on-premises NAS and SAN devices—a well-known example is NetApp FlexClone. In these environments, cloning enables fast snapshots of data, creating many additional copies of the data. Depending on the data change rate, deduplication can dramatically reduce the footprint of those extra copies, freeing up storage resources. StorReduce’s Object Clone brings this feature to S3 and Standard – IA. Leveraging deduplication, a clone can be created simply by copying the references to the unique blocks that have been stored with StorReduce, while leaving the data stored in S3 unchanged. Copying large amounts of object data may take hours per copy, and – lacking data reduction – you pay for every additional copy, regardless of how much of it is unique. With StorReduce Object Clone, you need only copy a small amount of metadata. Copying petabyte-scale buckets becomes nearly instantaneous, and multiple clones can be created in rapid succession. Additionally, secondary and subsequent copies of the data are low cost, even at petabyte scale. Using the StorReduce dashboard to perform a “Clone Bucket” request is as easy as creating a bucket in StorReduce or S3. Simply navigate to the source bucket to clone. Choose Clone Bucket from the Actions dropdown and specify the target bucket name and StorReduce handles the rest. It creates a duplicate bucket that is owned by the initiator of the request, and which inherits the source bucket’s data. Clones can also be created programmatically with two API calls, and you can always trace the name of the source bucket. If the source is deleted, this does not affect the operation, the contents of the clone, or access to it. Big data, Internet of Things, research – Clone petabyte-scale datasets so that researchers can work independently of each other in their own scratch areas. IT operations – Test new versions of software against your dataset in isolation. Developers, software testers – Clone your test datasets so that developers and testers can work with the whole dataset in insolation, not just a small subset. Roll the state back after failures and retest rapidly. Software quality assurance – Take a lightweight clone of an entire system at the point that it fails a test and hand it back to the developer. Hadoop, big data – Take point-in-time snapshots of the state of your cluster and roll back after problems. To learn more about how AWS can help with your storage and backup needs, see the Storage and Backup details page. Learn more about StorReduce Object Clone here. To request a StorReduce Object Clone free trial, contact info@storreduce.com. This blog is not an endorsement of a third-party solution. It is intended for informational purposes.